Washing soda is a naturally occurring compound of salt and limestone used for everyday cleaning of almost anything from floors to walls or drains to sinks. It's known by a few other names like soda, soda ash and sodium carbonate. If you make your own laundry detergent or household cleaners, you'll want to invest in some. If you're unable to find washing soda near you, or you are unable to buy the quantity that you need locally, there are many other retailers that carry it online. Free shipping is available on some options. The Vine also carries the 55 ounce box of Arm & Hammer Super Washing Soda for $7.99. They offer free, two-day or faster shipping if you place an order over $35, and they also have auto-ship options for those that use a lot of soda on a regular basis. 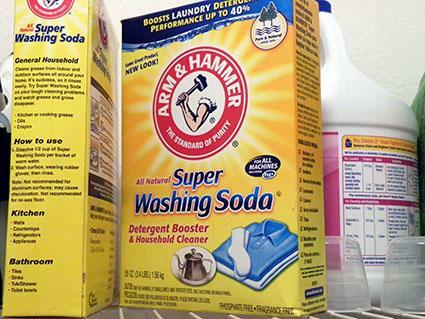 Soaps Gone Buy carries Arm & Hammer Super Washing Soda in a 55 ounce box. They price it at $5.95, and they offer a wide variety of different things you can do with the soda, including the quantities needed. If you are unable to find washing soda near you, or you're waiting for your shipment to arrive, it is possible to turn your baking soda into washing soda by baking it in the oven. Spread your baking soda out on a baking sheet. Place the sheet in the preheated oven and bake, stirring occasionally until the soda changes consistency, becoming coarser - about 30 minutes. Allow it to cool, then use it as you would washing soda. Once you have your washing soda, you'll find it invaluable at boosting your laundry detergent, making your own detergent or cleaning hundreds of different items in your house. Stock up to make sure you always have some on hand, and find out just how useful this product can truly be.